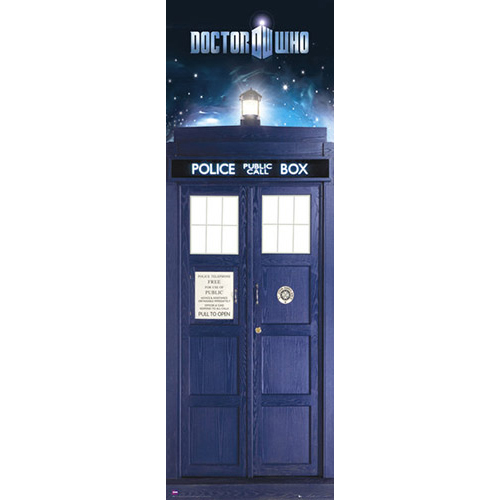 Doctor Who Tardis Door Poster | Turn your bedroom into a police call box! Turn your bedroom into a call box! Ah the Tardis... The Doctor's trusty spacecraft and time machine, a product of Time Lord technology. Now you can admire your own Tardis masterpiece with this large door poster (53cm wide x 158cm high). featuring the Tardis in all its glory. Perhaps you will never cross paths with the Doctor, but you can turn your door into the entrance of the famous timey-wimey Tardis with this high-quality admirable door poster. Dimensions: 53cm (w) x 158cm (h). This is a great poster!... Being a Dr Who fan, I wish I had this poster of the TARDIS when I was young! Thanks Coolthings.